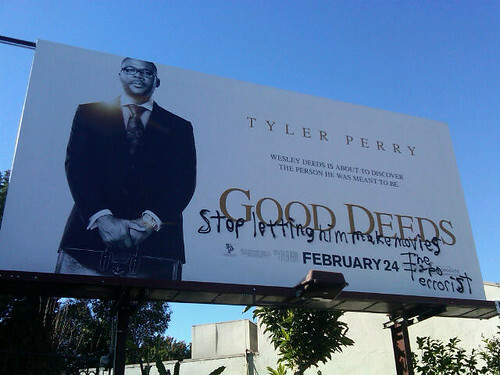 The Typo Terrorist is behind the tagging on this Silver Lake billboard for "Good Deeds." "Stop letting him make movies," the TTT pleads. Here's hoping somebody listens. If I'm missing the sarcasm in your endorsement of the tagger's derisive sentiment, apologies Mike. But if I'm not, then it seems you would rather some anonymous gatekeepers decide Perry can't creatively express himself instead of just exercising your right to ignore his filmmaking efforts. Yikes. no worries Will -- just making a funny. 'Mike will be here ALL week; for your dancing and dining pleasure!' - badoom-bum,Ching psshh. Tyler will have the last laugh Will; Madea presents 'The Return of Dolomite in 3D' As the great Roger Corman said, 'Jim Cameron is proof that if you're good, you'll get promoted...! But the truth according to Banksy may apply too .. live as a villian Die as a hero. Mike+TV guide; there is a heaven!!! on earth ! !